Michael Vick had a horrible preseason last year, and that turned out alright (endorsed by Spuds). 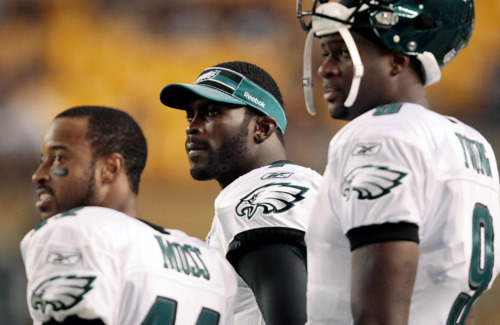 No Jeremy Maclin, Steve Smith, or Jason Avant (came out with minor contusion) meant Vick had to force his throws. Both of the Eagles run-stopping defensive tackles - Mike Patterson and Antonio Dixon - never played. The Steelers did go to the Super Bowl for a reason. Having some humble pie might be good for them right now. Good chance for Andy Reid to kick this “dream team” in the rear end. After a radical defensive makeover, the Eagles are going to need some time to learn how to play as a unit. At least there were no major injuries. LeSean McCoy looked good. And Mike Kafka. And Dion Lewis… until he fumbled. Tagged with Andy Reid, Awful, Game, Injuries, Jeremy Maclin, Michael Vick, NFL, Philadelphia Eagles, Pittsburgh Steelers, Preseason, LeSean McCoy, Mike Kafka, Dream Team. August 19, 2011 by Brian Solomon.